If you want to have the life of your dreams, you need to take control of it and direct it to where you want to go. That is what successful entrepreneur and author, Kevin D. Johnson says on this edition of the YoPro Wealth podcast. And it all starts with one thing: your mind. Kevin is the author of The Entrepreneur Mind, so he knows more than a thing or two about the subject. Whether you are an entrepreneur or not, this podcast is very important because you need to at least think like one for massive success. Listen in to learn why! How you can start to become an entrepreneur. The key successful traits that separate the successful from the pack. The #1 skill you need to learn. How a great entrepreneur thinks. How to recognize a bubble. The way to beat the competition. A top book that Kevin suggests to read. How to create new markets. Sales skills for introverts or technicians! The journey of an adaptable entrepreneur. The Ultimate Success Formula, the Four Agreements, and the two things needed to build massive wealth. This, and much more, is covered in the 2nd half of my interview with one of my coaches, David Wood of The Kickass Life Podcast. Be sure to listen in closely, as David has coached many people to massive wealth in a short time period! How to view your network and how you fit in. Why you have to take in the reality of how you show up. The people you should not let handle your money. The importance of paying yourself first. Why the vehicle and the community are key to financial success. How to get everything you want. David’s definition of a kickass life. Why it starts with the mindset. Have you ever met someone that you know is doing exactly what they were meant to be doing? Brittney Castro, of Financially Wise Women, is one of those people. Her and I have the same exact mission – to help you better understand your money situation, create massive wealth and build the life of your dreams. 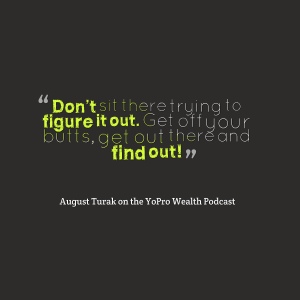 We talk about how you can do this in the episode of YoPro Wealth. Why you need to fail more often! How the successful entrepreneurs view things. Why to ask for help early and often. The way to make more money. Why you need to be clear on who you are, and what you can offer. The most common investing mistake. A simple investment strategy that will help you build wealth while reducing the amount of stress. How to prepare for retirement! Yes, you need to prepare now to save the headaches later! Why you need to make the decision to become wealthy. John Murphy is someone with a vast amount of knowledge. He started in the corporate world and worked his way up through the chain to be CEO. He later left some high powered positions to follow his heart and become an entrepreneur. Now, he runs John Murphy International and coaches executives and teams to help them achieve their full potential. He has worked in the finance and insurance industries, and provides outstanding advice on how to build wealth and win at business & life. I do not dismiss money, because their is a level of wealth that you need to create certain opportunities for your family. But wealth in the true sense is doing the things that you’re passionate about, engaging with the people you want to engage with. Doing the things that are going to develop you and improve you, and doing the things that will enrich you.